Protect your precious iPad and keep it stylish! No more scratches, no more accumulated dust! âœ"7 colors backlit: This iPad case has 7 different backlit LED colors (red, white, green, yellow, blue, purple and cyan), 3 level brightness. 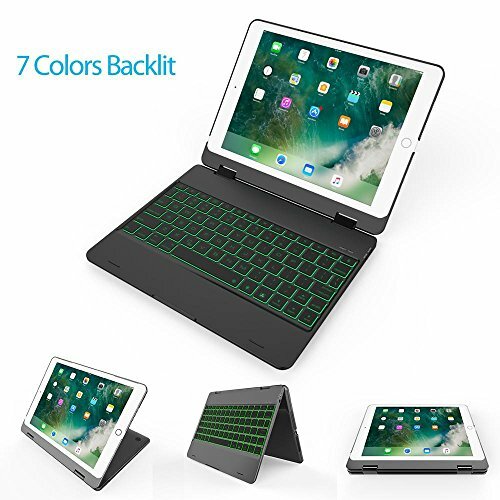 âœ"360 Rotate Stand Keyboard Case and 180 Degree Flip: Built-in hinges allow the iPad to be tilted up to 360 degree to provide the most comfortable viewing position. âœ"Auto Sleep/Wake Function: When you close the case it puts the tablet in sleep. It wakes it up when you open it. âœ"Ultra Slim and lightweight: Good looking case, well made and durable. âœ"High-quality: The keyboard is responsive and typing is comfortable. Perfect Access to all Switches, Sockets or Camera.